[QUOTE=Form]Its time to vote - please keep the topic and rules in mind, and note that your votes are public. Background: In the future we last spoke of, the inclination towards the aesthetic and luxurious continued for many years. People were comfortable and relaxed in their world. Life seemed to be steering a straight course, and the planet was slowly healing its wounds. However, the continuum of human evolution had not slowed. While a paradigm shift back to the ideologies of bygone times had been achieved, their could be no denying that the human mind was vastly more complex than ever before. In 2078, a group was formed, who were known amongst themselves as the 'Thinkers'. They were adamant that the peaceful existance of the world was merely a ruse. They thought it was simply too good to be true. Their basic human nature led them to question their existance, to continue the decades-old search for a meaning or purpose to life on earth. Their studies delved deep into the heart of the now fragmented religious beliefs of many cultures. Over several years, they concieved of, and marketed a system of 'Enlightenment'. As word of the grou spread, people were torn in two minds. Many felt the same insatiable frustration that led the 'Thinkers' to their work, and still others were convinced that this 'Enlightenment' was nothing but a marketing ploy. These naysayers were sent into overdrive not long after, when the 'Thinker Corporation' announced it had ifnished a prototype model of its 'Enlightenment 1.0' spiritual evolution machine. Brief:Your task is to concieve of a machine that the thinker corporation is using to help it's patrons achieve spiritual enlightenment. You must first choose whether you believe the Thinker Corp, or think that this machine is simply a clever marketing strategy designed to increase wealth, power, or ego. The Thinker Corporation has developed along the notion of 'knowledge is power'. With the goal of turning the world's people into their puppets Thinker Corporation developed the Enlightenment 1.0 bringing happiness to people through the idea of 'ignorance is bliss'. Enlightenment 1.0 is, in fact, a glorified lobotomiser, capable of various degrees of 'stupification' through the focusing of electromagnetic waves on particular areas of the brain. The level of 'stupification' is globally controlled through an encrypted satellite network so that the company can wait for market saturation before dumbing down the populace too much. In order to detract from the negative impact this product has on a person's mental capabilities Enlightenment 1.0 releases spores that create endorphins on contact with the skin, aiming to be released primarily in the nasal cavity or mouth to provide that feeling of 'enlightenment'. 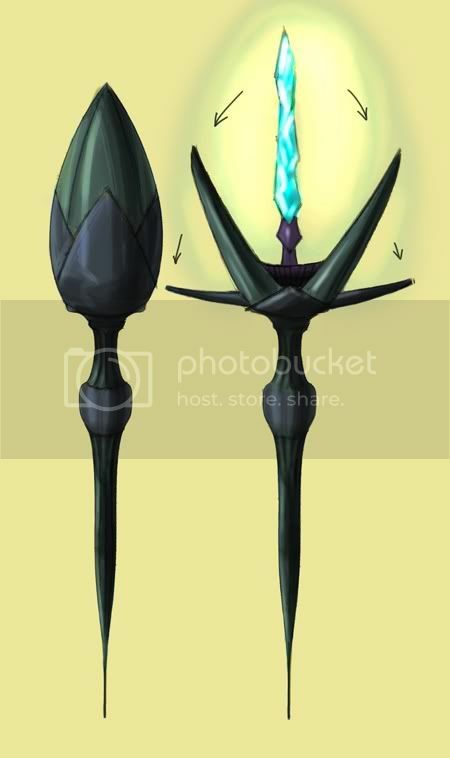 The spores are generated through the application of an electrical current to a bio-engineered 'mother' and decay rapidly leaving virtually no trace. Multiple use at the same level results in a negligible decrease in cognitive power, relying purely on the released endorphins. The workings of this model are kept in tight control - anti-tamper features stop users from deducing it's workings. The workings are hermeuticaly sealed as the internals are designed to decay rapidly in anything but an inert environment (argon is used). The endorphin releases need to have contact with air so have a decaying agent attached to both panels so in the event the back is removed the agent will be released. Another decaying agent is used to accelerate deterioration of the internals. The vials are completely destroyed in the process, leaving almost nothing for analysis. 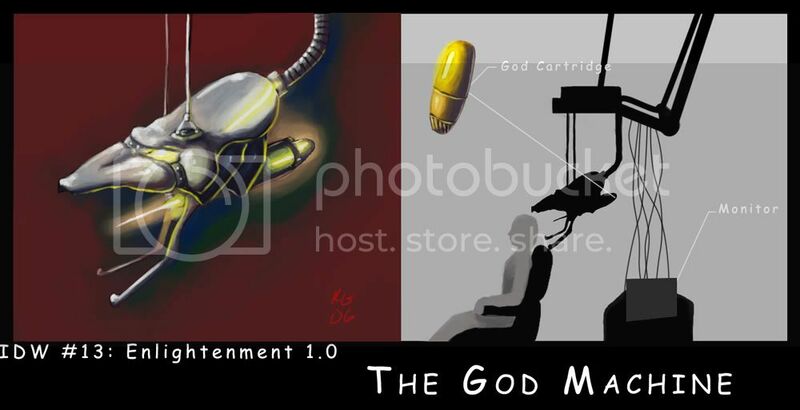 Enlightenment 1.0, a.k.a The God Machine. The Thinker Corporation has keyed in on the ideology that if one is told to believe, they will. The consumer visits an "Enlightenment Instalation" where a trained professional sits the user down, feeds them a sleeping pill and pain killer, lowers the God Machine behind them, fits the "mouth" over the back of their head and then monitors the situation as the computer goes to work. A "god cartridge" is fixed into the back of the machine and a long needle slides into the back of the user's head, seating itself deep into their mind. From the cartridge comes a series of information bits that spread throughout the brain effecting all parts and making the user see how god makes the world work. The amount of time changes how strongly one will believe what The God Machine makes them believe. From a mild belief to over-religious zealot, the time can range from 30 minutes to 2 hours. Sleeping Pill and Pain Killers- Because the God Machine is effectively sticking a needle in your brain and bombarding it with informtaion, the process is indeed painful. Migranes are an uncommon side-effect after an "Enlightenment Operation." A worst-case scenario can put a user into a coma that may cause permanent brain damage, but this has only happened once, due to the failure of one technician to properly monitor the operation. The God Cartridge- This contains all of the information in just the right amounts for the user's choice of enlightenment. Because of the amount of technology, power, and risk involved, the Enlightenment Operation doesn't run cheap and isn't currently available for home use. The entire operation will run the user $200 to $800. Critics of the "Enlightenment 1.0" were correct to be wary. Their suspicions were validated when they discovered ThinkCorp's new "spiritual evolution machine" to be nothing more than a pleasantly humming air purifier and lit container of bubbling water. However, what they did not realize is the research behind this placebo. The altruistically-oriented Thinker Coporation has realized the ease with which the human mind can attain true enlightenment. Most people do not reach this state because of psychological blocking. They do not believe that they can attain it on their own. With a little positive reinforcement of thier efforts (the mystical bubbly water) and an environment to concentrate in (fresh air), the human mind can deeply connect with the body, and the spiritually transcend the vices of the world. I based my concept on the old buddist and monk theory. It's basically a meditation machine but instead of reaching enlightment through years and years in a far away temple, you can do it a lot faster. It works by purifying your thoughts and washing away the desires that stops you from getting to a more spiritual level. It's also like dreaming, it cleans what should be memorised and what should be discarded. 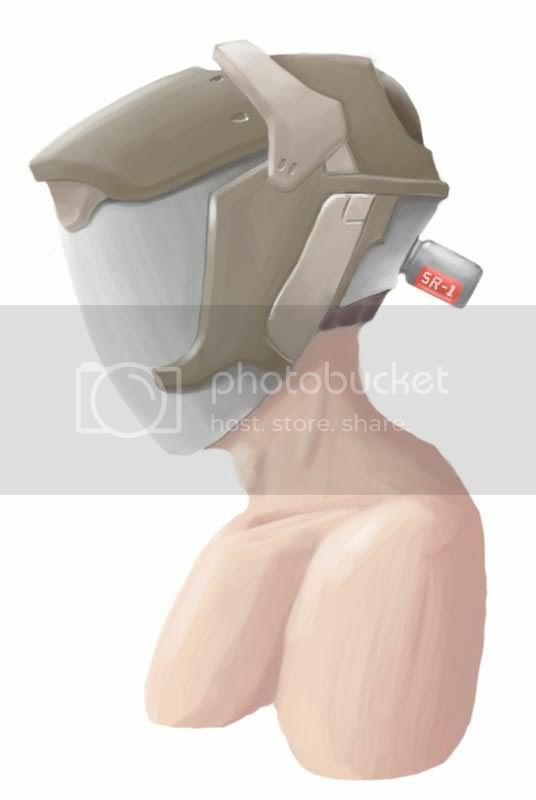 The helmet completly shuts down your thinking process and take away all negative energy and put it in the small bottle in the back that you can recycle when you get a new one. Worn across the shoulders Enlightenment 1.0 or 'The Butterfly Wing' as it soon became known, amplified the empathic ability of the user and projected their own feelings to those nearby. The 'enlightened' would be always in tune with those around them and respectful to all life.The feelings of those around them would become more important than their own and they would strive to better themselves for the benefit of others. The fine metallic threads woven into the material of the wing act as small aerials recieving and broadcasting the empathic signals between devices, the hub mounted on the collarpiece then routing the signals to the brain passively through the body's own bioelectric field. "The photosensitive surface reacts to pure sunlight, fresh air, fresh water and pollen and changes this collected energy into light. First it's only a dim light but this will ultimately look like a beautifully glowing, white neclace. This way, the owner of the cristal is motivated to travel around the world, seeking more beautiful natural resorts travelling far and wide to collect the biggest amount of different "enlightment-points". This concept is about cherishing nature and actively experience it. So in the end, enlightment doesn't come from the product itself, but the actions that the product motivates you to do." Ok for a bit more technical approach: The cristal-like pendant is covered with a photosensitive surface that reacts to all kinds of nature influences and changes these into energy, that is first stored in a battery inside. This energy is then led to the oleds inside this surface to create light. The more nature-influences are being collected, the brighter the light will be. Additionally there's an integrated flash memory to store personal information so this pendant can also be used like a future credit card or ID: The pendant is simply being inserted into a "needle" drive that reads the information..
Had to go for Flip on this one. The illustration does the best job describing the working of the gadget and I felt it adhered more to the topic. Tier_one was a close second. Difficult choice, everyone did well with the concepts. I ended up voting for what I felt was the best industrial design piece. Tier_one got my vote, it's the most complete concept, clearly showing how the product functions. jcdied4me got mine, although it's the least informative in terms of industrial design information, it sells the product concept more for me than the others. The idea is like a cross between a shamen vision quest and a sunbed which I can see fitting right into a near future world.